Turkish nationalist opposition party leader Meral Akşener has questioned the seriousness of President Recep Tayyip Erdoğan’s foreign policy positions in an interview with secularist newspaper Sözcü, telling him that if the United States was really undermining Turkey as he says, Turkey should respond by closing the İncirlik airbase, used by U.S. warplanes. “I look at the speeches he has made; Afrin is mostly under Russian influence, but Mr. Erdoğan shouts at the U.S.,” she said. 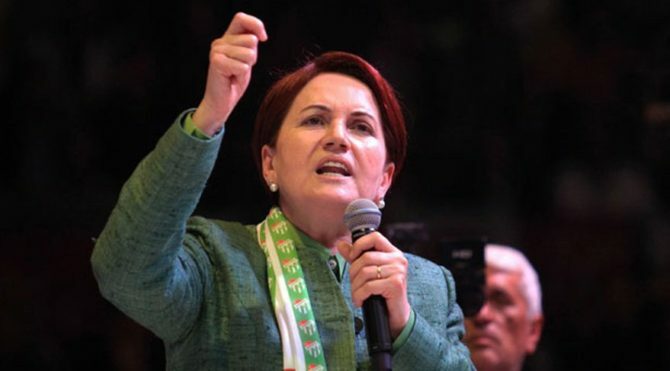 Akşener emphasised that the government should not go to war lightly, and recommended that politicians whose sons had bought their way out of military service be sent to Afrin if action was to be taken. “If the serious space called the state has given a serious decision in relation to Afrin, of course we are behind our state as Turkish citizens, but it is mothers’ dear sons who will go there and face possible martyrdom,” she said. Akşener also commented on Steven Spielberg’s movie The Post, which she and the interviewer had just been to see. The film, the newspaper said, included incidents of the press being accused of being traitors, bans on press accreditation and other repression of the media in ways that Turkish journalists would recognise. ABD bu işin suçlusuysa İncirlik Üssü’nü kapatın Cumhurbaşkanı Erdoğan’ın her fırsatta ABD’ye ‘Eyyy’ dediğini hatırlatan İYİ Parti Lideri Meral Akşener, “Afrin’de Rus nüfuzu var. Amerika bu işin suçlusuysa Malatya’daki üssü, füze sistemini, İncirlik’i kapatın” dedi.